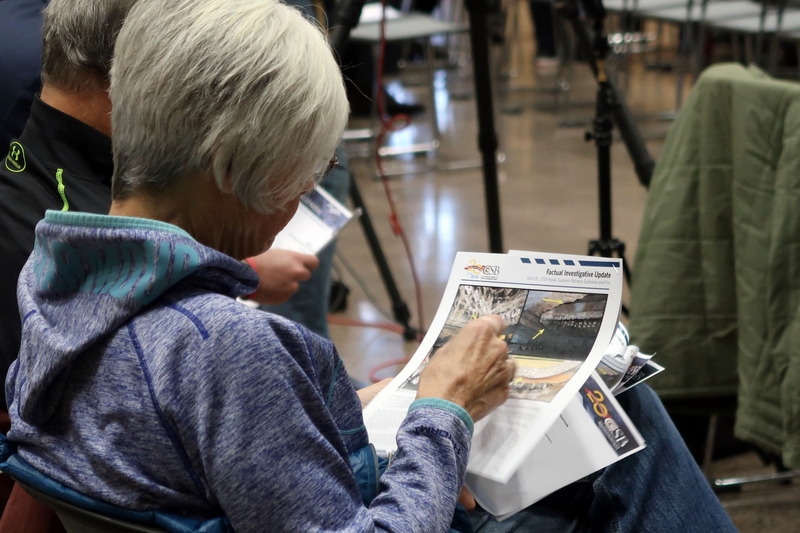 After calls from Minnesota and Wisconsin lawmakers this fall for a public hearing on the Husky Energy fires and explosion, the U.S. Chemical Safety Board held a meeting in Superior to hear from concerned citizens and update the public on the agency's investigation. 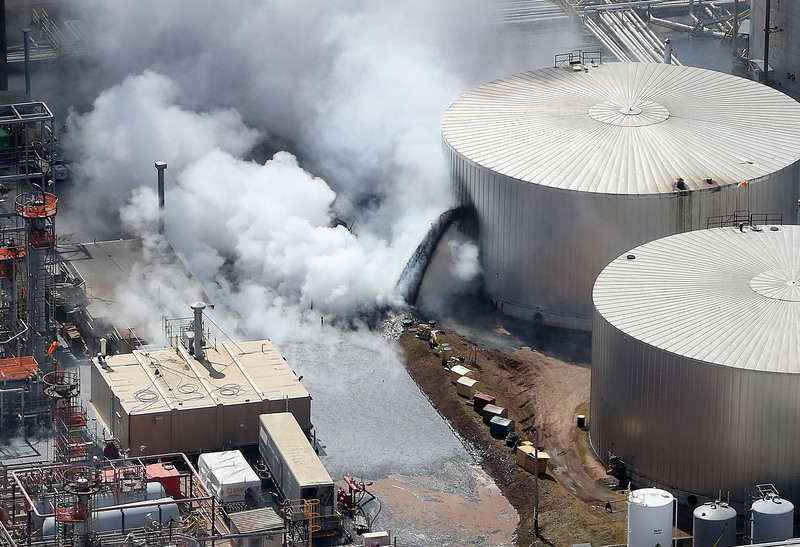 In August, the CSB said a slide valve failed in a unit that appeared to allow a flammable mixture to form and likely caused the explosion at the Husky Energy's refinery April 26 in Superior. As previously reported by WPR, the explosion, which lead to the evacuation of part of the city, took place in the refinery’s fluid catalytic cracking (FCC) unit around 10 a.m. that day. The FCC unit transforms crude oil into a more useable form like gasoline by cracking hydrocarbon molecules using a catalyst and high heat, CSB investigator Mark Wingard said Wednesday during the public hearing in Superior. "The actual explosion occurred in a number of pieces of process equipment downstream," Wingard said. At the meeting Wednesday, the CSB showed a picture of the worn slide valve, which serves to prevent flammable hydrocarbons from mixing with air in the unit; if they mix, an explosion can occur. In its update, the agency said the company's safeguards to avoid a flammable mixture were ineffective because the company didn't consider potential erosion of the valve. Slide valves within the FCC unit are in constant use because the refinery is always running. Wingard said the valves are being "sand-blasted" day after day and erode over time. "It’s unclear to us right now whether or not ... a brand new slide valve, how long you can rely on it to actually maintain a barrier," said Wingard. The refinery was in the process of shutting down for a five-month turnaround to do routine maintenance and inspections when the explosion and fires happened. CSB board members asked a variety of questions about the investigation Wednesday, including whether the agency may make broader recommendations to the refining industry over the use of slide valves. "Is there a concern that this kind of slide catalyst failure could happen again elsewhere with a different set of circumstances?" asked Kristen Kulinowski, interim executive of the CSB. Wingard responded that there are safe ways to shut down refineries, noting the unit at Husky has been operating since 1961 without incident. "FCC units around the country are shutting down or starting up on a fairly regular basis and we’re not having these explosions constantly," Wingard said. The CSB investigator said they’re trying to determine the circumstances that led to the Husky incident and another explosion that involved a worn valve in recent years at a refinery owned by Exxon Mobil in Torrance, California. Board members also asked about the distribution of debris, layout of refinery facilities and whether Husky Energy had appropriate safety processes and procedures at the plant and corporate level. Wingard said further details on the company’s safety culture would be included in its future report. The CSB’s investigation may extend into next fall. The CSB has said investigations into incidents typically last a year to 18 months. As WPR has previously reported, the CSB investigates chemical accidents, identifies whether there are any gaps in safety that can be addressed and makes recommendations. The agency does not have any enforcement authority or issue penalties related to their findings. So far, the agency has interviewed more than 50 witnesses, and requested and reviewed more than 14,000 documents. The initial explosion sent debris throughout the refinery and punctured an above-ground storage tank. The tank contained around 50,000 barrels of asphalt, of which about 15,000 barrels were released into the refinery and caught fire two hours later. The CSB has reported 36 people received medical attention related to the explosion and fires – 11 with "OSHA recordable injuries." OSHA is the Occupational Safety and Health Administration, a federal agency that sets and enforces standards for safe and healthy working conditions. A WPR employee at the hearing estimated about 150 people attended the meeting. Before the meeting recessed at noon, about 15 people offered their input to the agency’s board. Many of them voiced concerns over the refinery’s use of hydrogen fluoride, a highly toxic chemical used mainly for industrial purposes but can cause serious health effects in people exposed to the chemical, according to the Centers for Disease Control and Prevention. The fires and explosion were about 150 feet of the refinery’s hydrogen fluoride tank. The use of the chemical prompted the evacuation of part of the city. Ginger Juel, co-founder of the Twin Ports Action Alliance, questioned whether Twin Ports officials were doing enough to protect the community from the risks, specifically Superior Mayor Jim Paine. "Jim Paine doesn’t want to talk about hydrogen fluoride anymore," said Juel. "Jim Paine has told constituents as recently as last week that hydrogen fluoride is less dangerous than automobiles." In remarks at the beginning of the meeting, Paine said safety is the city’s No. 1 priority in moving forward with all industry in the city of Superior. He and Duluth Mayor Emily Larson called on the refinery to end use of the chemical shortly after the explosion and fires. "We want to keep a refinery in the city of Superior. It is valuable to our economy, but we must make sure that we are protecting our citizens, our employees and our first responders before any other consideration," Paine said. Atticus Larson, Husky electrician and union district director for the Local 420 Operating Engineers, said everyone agrees there are things that could be improved at the refinery. He spoke about updating policies, procedures and training. "Although Husky is new to the employees and we are really still in the getting to know each other stage, I believe Husky will do it right and do it safely," said Larson. "Husky has been a class act. They have done to this point everything they said they would. They have followed every recommendation to my knowledge that was given to them from outside agencies." People from Wisconsin and Minnesota pressed board members to urge the company to transition to alternatives to hydrogen fluoride and feared emergency services were not prepared to handle a release of the chemical. Susan Hedman, attorney for Clean Wisconsin and the former regional administrator for the U.S. Environmental Protection Agency, said they’d like the Chemical Safety Board to make recommendations to improve public safety. "Clean Wisconsin is calling on the CSB to issue a report that includes specific recommendations to reduce the risk of hydrogen fluoride to refinery workers and the public," she said. Hedman said the agency should recommend that Husky discontinue or phase out the chemical’s use. If not, she said the refinery should implement changes to reduce the risks of the chemical before it resumes normal operations. Jared Hawes, director of state and local outreach with the trade association American Fuel and Petrochemical Manufacturers, said the industry meets and exceeds regulatory requirements for using hydrogen fluoride. "In total, refineries only represent about 1.5 percent of global (hydrogen fluoride) demand, and the remaining 98 percent are used by a range of industries that make products," said Hawes. He said those products include detergents, cars and computers. About 50 refineries nationwide use hydrogen fluoride. Husky and the CSB have said that the tank was not compromised. A Husky spokesman said in an email Wednesday that it is continuing to work with the agency to understand the cause of the explosion and identify lessons learned. "We’ve appointed an engineering contractor to oversee design work for the rebuild and as part of that process, we continue to evaluate options around the use of hydrogen fluoride," wrote Mel Duvall, senior media and issues manager for Husky. Duvall added there will be no layoffs as a result of the explosion and fires, noting safety of employees and the community remains the company’s priority. In closing remarks, CSB board member Rick Engler said the board has to follow the facts of the investigation. However, he pointed out a myriad of studies and publications examining the risk or transition away from hydrogen fluoride, including a 2013 report by the United Steelworkers of America. The survey reported that the 50 refineries using hydrogen fluoride had 131 hydrogen fluoride-related incidents or near misses between 2010 to 2013. "I feel strongly that there have been enough incidents over history. There’s enough, I think, consensus among many, although I certainly think there will be disagreements among industry management on this, that hydrofluoric acid alkylation poses a potentially severe risk to communities and the CSB needs to take some type of action steps to move this question forward," said Engler. Editor's note: this story was updated at 4:45 p.m. Wednesday, Dec. 12, 2018 to include additional public comments.